With an overwhelming choice of basses out there, finding a cheap bass guitar isn't the difficult part. However, budget conscious bassists should be wary about buying into a "false economy" at the lower end of the price spectrum. The below four-string picks (see here for five string basses) have been carefully selected based on positive reviews and comments across the web. Some models that were initially planned for inclusion were eventually ditched (such as the Epiphone EB-3), because they failed to meet the expectations of so many users. There were too many warning signs. So, with price vs quality weighed up over a number of criteria, here is your definitive cheap four-string bass guitar guide. We've managed to keep things under $350, which has surprised even us! These three basses continue to exceed expectations and offer those of us with little disposable income a great playing, great sounding, gig worthy bass. Best For Beginners & those on a very tight budget who still want high quality sound & build. Bassists who want a modern look & sound with thin neck & bass boost option. Bassists who want classic looks and tone but also versatile for modern styles. Defining Features Very low cost. Easy to play. Lightweight. Well rounded, balanced tone Slim neck. Phat II active boost for very deep bass. Classic JB cut. All maple. Short 20 fret scale. Versatile. If you're just starting out on bass, Yamaha's RBX170 checks all the boxes. Easy to play and durable, delivering a well rounded, balanced sound. Beginners love it, more experienced players highly recommend it. This is a pretty stripped down, no nonsense bass. Passive pickups, string through bridge, light body, simple finishes and great Yamaha playability out of the box. The RBX is as durable and reliable as has come to be expected from Yamaha equipment. Although many deem it a beginner's bass, it will withstand even the most riled up of live shows. It stays in tune, even though the tuners themselves aren't anything particularly special. So how does it sound? Surprisingly versatile, with plenty of punch and sustain. The volume and tone knobs provide a dynamic and responsive array of tonal options rather than simply being flat and on/off as with many cheaper passives. You'll get surprisingly more volume out of the Yamaha stock pickups than your standard passive bass and its tonal range is impressive for such a cheap bass guitar. One thing I noticed when reading through reviews was that rock, metal and punk players felt especially at home with the RBX170's sound and feel. However, it can certainly get fat and smooth enough for jazz and deep blues or funky grooves. It has a raw, natural quality which gives you plenty of room to layer on some EQ or effects and find your tone. Overall, yes, great for beginners (almost a no-brainer purchase) but also impresses more experienced players who perhaps want a reliable, great sounding backup and/or something they can work on in future. Based on one of the world's most played bass models, the Soundgear, the Ibanez GSR200 carries with it all the quality control, setup and quality parts Ibanez are renowned for. It's safe to say you can't go wrong with an Ibby, whether you're a beginner or pro. Another great playing budget bass boasting a quick and slim GSR4 neck profile and ultra low action. Balanced, very light (thanks to the agathis) and the modern-classic, ergonomic body design. Robustly made and beautifully finished. Ibanez basses are typically easy to set up, so if it's not quite right out of the box, you'll have easy access to the truss rod and a very accessible bridge to get that action and intonation just right. The GSR200's staple sound is balanced, warm with a satisfying thump and good sustain. Turn up the treble and you get that nice P bass style ring. Use the Phat II active electronics to give the bass response a hefty boost. Very sweet response to fingerstyle, very cutting with a flat pick and most certainly built for slap. In fact, many users claim slap is its speciality. Users also agree the GSR is built like a tank and a very reliable gigger. Rest assured, for $200, you're getting a lot of bass for your money. If you're a beginner, the Ibanez is a nice alternative to the Yamaha RBX170 for those who want a slimmer and shorter scale neck (22 vs 24 frets) but with a similarly modern design. Classic Jazz Bass tones with a more modern, higher output bridge pickup. A match made in bass heaven. The Squier Vintage Modified Jazz Bass offers players of all levels one of the most versatile tonal palettes you'll find on an electric, whilst retaining a truly vintage vibe at its core. A very basic but elegant feature set, the 70s version of the Squier VMJB takes those classic Jazz Bass curves and adds the option of a beautiful natural finish with black pickguard and black inlays over a maple fretboard. 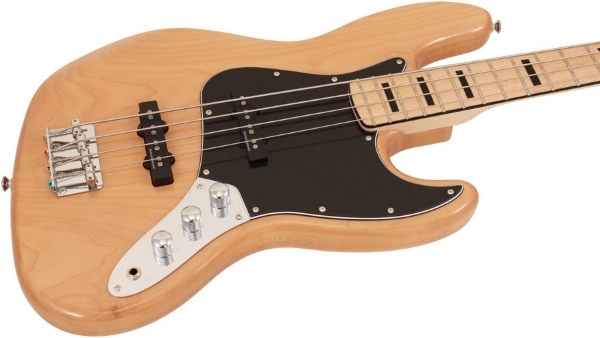 People tend to buy Jazz basses for their versatility, and the VM certainly delivers that. It'll handle anything from the noisiest punk to the softest walking grooves. It can mimick the P-bass sound with those ringing overtones and give you all the deep bite you need for slap. Being all-maple, you'd expect a natural brightness to the tone, but users looking for those deep, rumbling lows have found them on the VM no problem. The maple just gives them that extra punch and crisp overtones. The bridge pickup delivers a growl that hasn't been heard on other incarnations of the Jazz, enhancing that boldness players typically associate with the JB. While the bridge pickup defines the "modified" in VM, the neck pickup has retained that classically rich, round and flat JB tone associated with the Standards. So in reality, what you're getting is the best of both worlds - a truly modern twist on a retro vibe. Squier have balanced it perfectly, and the reviews acknowledge that.